This manual describes the Torpedo C.A.B. M and provides instructions for its operation. It is highly recommended that you read this document before using the product. The contents of this manual have been thoroughly verified and it is believed, unless stated otherwise, to accurately describe the product at the time of shipment from the factory or download from our website. This document is the exclusive property of OROSYS SAS. In the interest of product development, OROSYS SAS reserves the right to change technical specifications, modify and/or cease production without prior notice. OROSYS SAS cannot be held responsible for any damage, accidental or otherwise, that results from an inappropriate use of the Torpedo C.A.B. M Please refer to the safety instructions included in this manual. The reproduction of any part of this document is strictly forbidden without the written authorization of OROSYS SAS. All product names and trademarks are the property of their respective owners. Product names and trademarks found in this document were used during the development of the Torpedo C.A.B. M product but are in no way associated or affiliated with OROSYS SAS. The Torpedo C.A.B. M must never be used near a heat source, near a flame, in the rain, in damp areas, near any kinds of liquids. When transporting the unit, care needs to be taken to avoid any shocks that could cause damage that would require the assistance of a qualified technician. Two notes Audio Engineering is proud to introduce the Torpedo C.A.B. M (Cabinets in A Box), the missing link between the guitarists rig and the PA or an audio interface. Use the best virtual cabinets available or load your own IR files. This is the pedal version of the critically-acclaimed Torpedo hardware series, optimized for live playing. This product has been developed through years of technical research, with great attention to the needs of guitarists, bassists and sound technicians confronted with the challenges of miking instrument amplifiers, on stage or in the studio. Our goal is to provide ease of use, reliability, versatility and above all, perfect audio quality. The Torpedo technology was created as an answer to the high pressure musicians have to deal with: lack of time, limited gear availability, loud amplifiers that cant be played at desired volume, as well as bulky and heavy cabinets to carry. In addition, many musicians are more comfortable with their analog amplifier and effect pedals, and dont want to perform using digital modeling systems, which may compromise their playing style and sound. For these players, the Torpedo C.A.B. M offers a virtual alternative to traditional miking, using a technology derived from the convolution reverberation, to achieve a degree of realism never experienced previously with simulators. The Torpedo C.A.B. M is the perfect line output everybody should have at the final stage of their pedalboard or after their amp section to send the sound directly to a PA or a recorder. The Torpedo C.A.B. M finds its place on your pedalboard, after a preamp, among your usual stompboxes, or between the amp and the speaker cabinet as an amp DI. The Torpedo C.A.B. M comes with a large library of 32 cabinets and 8 microphones among the most commonly used models in the world. 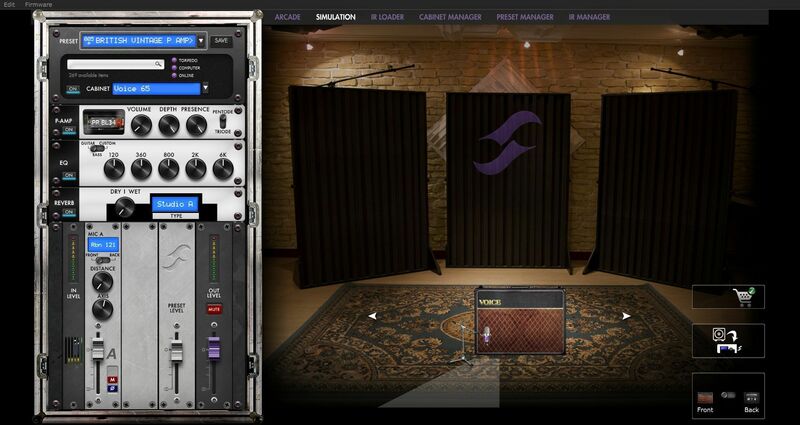 You can also upgrade and add many other cabinets through the Two notes Store, our online virtual cabinet store.The virtual miking is achieved by choosing one cabinet and two microphones, and fine-tuning the position of each microphone in front of the cabinet. The Torpedo C.A.B. M allows the user to assume the role of the sound engineer in a professional studio. The Torpedo Technology: to bring you realism and playing comfort, Two notes has developed a unique technology based on an adaptation of convolution techniques. Starting with the measurement of an actual cabinet + microphone setup, the Torpedo C.A.B. M can accurately reproduce the system as it was measured, as well as the microphones position in space. In order to take full advantage of these digital algorithms, the highest quality audio design assures a perfect analog-to-digital conversion and a huge dynamic range to retain the ultimate playing experience. This product has been thoroughly tested in professional studios and stage environments and is the alternative many musicians are looking for, to achieve a professional sound capture of their amplified instruments. The Torpedo C.A.B. M will give you the elusive sound of the greatest recording studios and producers, anytime, anywhere. Please keep in mind that the Torpedo C.A.B. M is not a loadbox: when connecting the speaker output of your amplifier into the amp input of the Torpedo C.A.B. M, you must always connect a speaker cabinet to the THRU output. The amplifier output impedance must always match the speaker cabinet impedance. The Torpedo C.A.B. M is a standalone unit you can bring with you in any situation, whenever sending direct sound to a PA or silent playing is needed. At each step, Two notes Audio Engineering implements its know-how to offer the most advanced simulations on the market and ensure absolutely realistic quality both for the musician (in terms of playing sensation) and for the listener (in terms of sound quality). You can load up to 32 Two notes cabinets in the Torpedo C.A.B. M. Download the free Torpedo Remote software (Mac OS X and Windows PC) from the Two notes Audio Engineering website, and you will be able to add or remove the stored cabinets. There are currently more than 280 Two notes cabinets available in the Two notes Store that you can try in real time and purchase (requires a working Internet connection). When using guitar/bass preamplifiers with some other speaker emulators, the musician may feel they miss the power amplifiers contribution to the overall sonic texture. Many musicians get their sound from a particular use of that element and the Torpedo C.A.B. M gives you the possibility to use it too. To that effect, Two notes Audio Engineering has developed an original tube-stage modeling that gives you a choice of 4 different tube models (6L6, EL34, EL84 and KT88) in Push-Pull (PP) in AB class, or Single Ended (SE) in A class configurations. You can push this tube stage like a conventional amplifier and look for that subtle yet particular distortion. The Torpedo C.A.B. M can be used as a super-DI for keyboards. 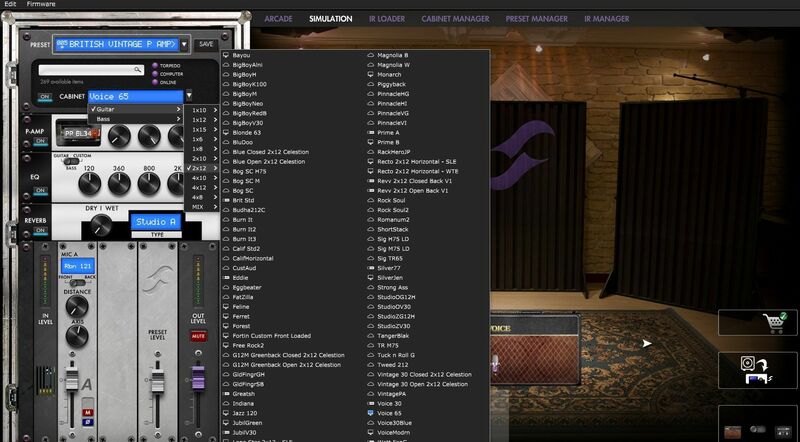 The tube-amp simulation feature, developed for guitarists and bassists, can also be a very interesting device to warm up the sound of a synthesizer, an organ, or a digital piano. When recording guitars or basses, it is common to apply a few effects to shape the sound before sending it to a PA or a recorder. In the Torpedo C.A.B. M you will find a simple but efficient EQ filter with three modes, GUITAR, BASS or CUSTOM. 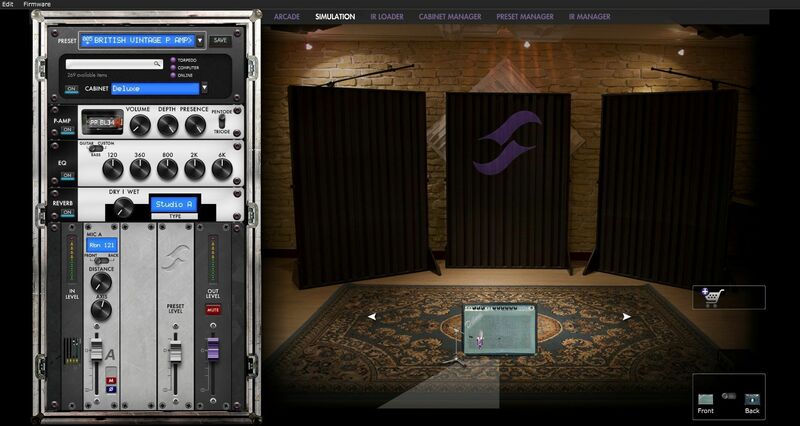 One of the latest additions to our Torpedo firmware is a room reverb. When recording a guitar or a bass, the room sound is really important, especially with distant miking. With the Torpedo C.A.B. M, you get the option to choose how the record room sounds! ). It is particularly well suited for speaker miking simulation. Two notes has developed a unique technology based on an adaptation of convolution techniques. Starting with a measure of a real cabinet + microphone setup, the Torpedo C.A.B. M can accurately reproduce the system as it was measured, including the microphones position in space by using IR synthesis. The Torpedo C.A.B. M is capable of delivering the best guitar and bass tones by using the Torpedo technology, but you can also embed impulse responses that you have purchased or downloaded for free from 3rd-party developers, in WAV or AIFF formats. You can upload third-party IRs in the Torpedo C.A.B. M using the free Torpedo Remote software. Download the free Torpedo BlendIR software from the Two notes Audio Engineering website. 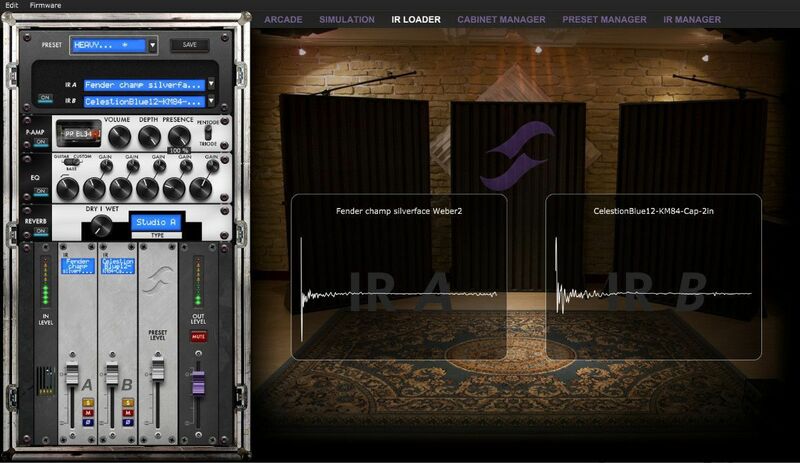 With this software you will be able to capture your own cabinet + microphone setup and embed its sound signature into the Torpedo C.A.B. M.
), which then become brighter and clearer. This position also allows to take advantage of the possible stereo of these effects. This is similar to the way things are done in the studio, where modulations are often applied to guitar and bass tracks after recording. The Torpedo C.A.B. M can also be used after a loadbox connected to your amplifier in place of the speaker cabinet (such as the Torpedo Captor). Simply connect the line output of the loadbox to the Line Input of the C.A.B. M. This will provide a silent playing rig, where you can take fully advantage of your amplifier's tone, without having to deal with sound level issues. Plug your Torpedo C.A.B. M as the last mono pedal on your pedalboard (for example after your distortion pedal). You connect your pedalboard to the AMP/INST/LINE IN (item N°4 in the overview diagram above) of the C.A.B. M, and the DI OUT (item N°12) or LINE OUT (item N°13) to a mixing desk or an audio interface. Set the input gain switch IN LEVEL (item N°6) so that the level coming in the pedal is visible on the bargraph of the screen, and not clipping. With this amp-less setup, we recommend to turn the Power Amp section (see section 4.3.1 for all the details about the Power Amp section) of the C.A.B. M so that the combination of your pedalboard and the emulated power-amp simulates a complete amp rig. We recommend putting any modulation, reverb and delay effects AFTER the Torpedo C.A.B. M. This is what is usually done in the studio, especially when using stereo effects. The Torpedo C.A.B. M being MONO, any stereo signal sent to the unit will be converted to MONO. Moreover, if you set up the Power Amp simulation to a high volume, some distortion will appear. It is totally different to send reverb or delay into a distortion stage (like you would do in the effect loop of an amplifier) and to send a distorted sound into a reverb or a delay (like you will do by following this advice). Try both and pick the one that fits you. Insert the C.A.B. M between your amp and your cabinet. To do so, connect your amp to the AMP/INST/LINE IN (item N°4 in the overview diagram above) of the C.A.B. M with a speaker cable and connect the SPEAKER OUT (item N°5) of the C.A.B. M to your cabinet, again with a speaker cable. If you are using a combo, unplug the speaker cable connected to the amp section of the combo, plug this embedded combo speaker in the SPEAKER OUT of the C.A.B M, and connect the AMP IN of the pedal to the output section of the amp with an additional speaker cable. The C.A.B. is NOT a loadbox. Always keep a cabinet connected to the SPEAKER OUT when an amp is connected to the AMP IN of the pedal. Connect the speaker output of the amp to the AMP IN of the C.A.B. M, then connect the SPEAKER OUT of the pedal to a loadbox (such as the Torpedo Captor). The SPEAKER OUT is an uncompensated output (meaning without any kind of filter/analog speaker simulation, a dry output). It is also possible to plug the loadbox before the C.A.B. M this way: connect the loadbox to the speaker output of your amp, then connect the uncompensated output (meaning without any kind of filter/analog speaker simulation, a dry output) of the loadbox to the Torpedo C.A.B. M. Depending on the output level of the loadbox, set the input gain selector of the pedal to have the appropriate input level on the screen. When using the Torpedo C.A.B. M with an amp, we recommend switching OFF the Power Amp simulation section. The Torpedo C.A.B. M is a standalone unit, but you can control it from your computer (PCWindows or Mac OSX) with the Torpedo Remote software using a USB connection Create, save and load presets, load new cabinets or Impulse Response (IR) files. Download the Torpedo Remote for free on the Two notes Audio Engineering website. You can also control the Torpedo C.A.B. M from a mobile device (tablet or phone) with Torpedo Wireless Remote. You will have access to all the parameters of the unit. Unlike the Torpedo Remote used with a computer via USB, you will not be able to load new cabinets or IRs in the pedal through your mobile device. You may have discovered an idea to use the device in some innovative way. Do not hesitate to come and share your experience on the Two notes Audio Engineering Forum or social networks. Please go to the Two notes Audio Engineering website and click on the Community section. Two notes is also on the social networks Facebook, Soundcloud and Youtube  so do not wait and come share your creative work! The Torpedo C.A.B. M is organised around 2 environments : PERFORM and MENU accessible with the 2 encoders on the front panel (which are also push-buttons) as seen in figure 2.2. The MENU environment gives you access to the parameters of a preset, allowing you to modify it, or create your own tone from scratch. To enter the MENU environment from the PERFORM environment, press either the left (MENU) or the right (ENTER) button. This will display the top layer of the MENU environment, which lists various sections you can edit. By entering any section, you'll go down one layer, accessing the parameters of the preset (or device). All starts with the first section, which allows you to chose which mode you will be working in : Arcade, Simulation or IR Loader. To enter any section and edit the related parameters, scroll to the relevant section by turning the PARAM encoder and press ENTER to enter. Some sections can be modified directly without entering it, by turning the VALUE encoder. For most of them, this means turning it ON or OFF (the image will then appear in negative mode). Depending of the mode, the editable sections change. We will go through the sections for each mode. 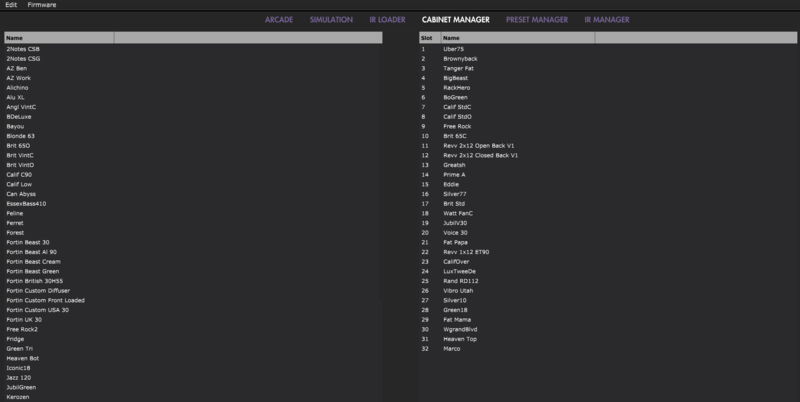 In the simplified interface of the Arcade mode, each parameter actually controls one or several parameters of the device. The interface of the Arcade mode has 3 specific sections, detailled hereunder. Guitar or Bass, it determines the type of speaker cabinet you can access to and select later, the power amp type and parameters and EQ characteristics of the Contour parameter. 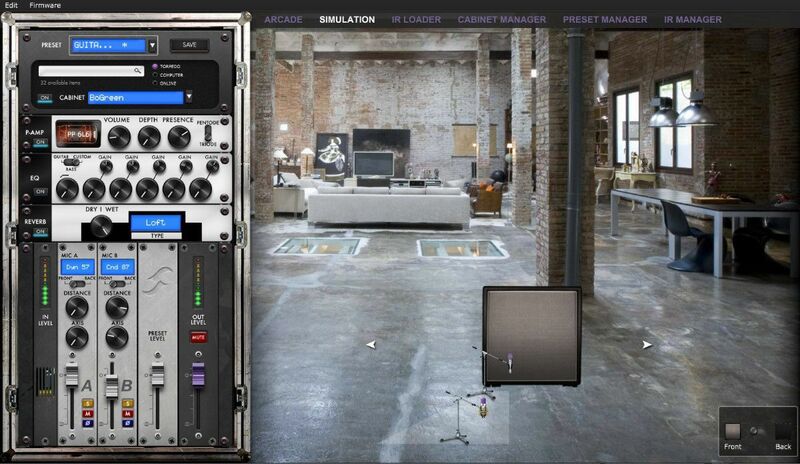 This section lets you choose your virtual cabinet, the microphone and the reverb room where the combination of cabinet and mic is set. Note: in Arcade mode, you can only use one microphone. Here you will set the tone of your cabinet and mic combination. Distance: In Arcade mode, Distance triggers both the mic placement algorithm (IR synthesis) and the Dry/Wet of the Reverb. The farther the microphone is from the cabinet, the more you will hear the reverb effect. The microphone is always placed in front of the cabinet. The Simulation mode gives you access to every parameters available to create a preset. The interface of the Arcade mode has 4 specific sections, detailled hereunder. When using the Torpedo C.A.B. with any kind of guitar/bass preamplifier, or even an electric piano or a synthesizer, you need the color brought by the final stage of a traditional amplifier: the power amplifier. Plug your device to the Torpedo C.A.B. and enjoy the typical sound of the Two notes electrically accurate virtual tube power amplifier. Model: Choose the amplifier topology (Push Pull (PP) or Single Ended (SE)) and the tubes type (6L6, EL34, EL84 or KT88). 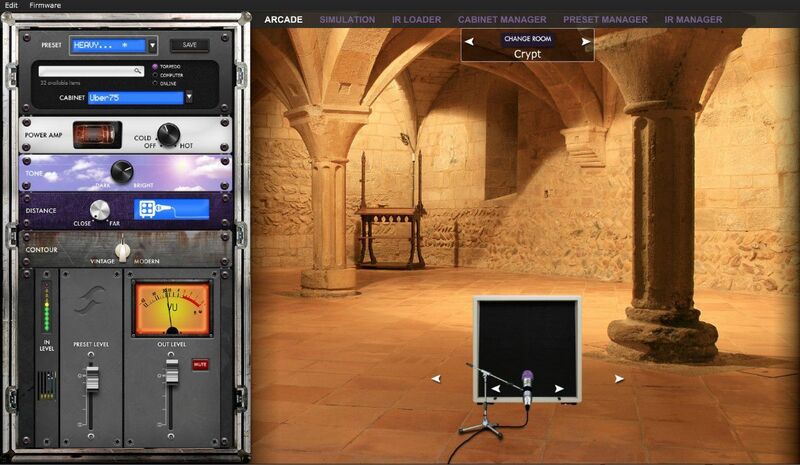 The MIKING section is where you will choose your virtual cabinet and the two microphones to do the miking. You have access to 32 different cabinets and each cabinet can be miked with 2 of the 8 available microphones for the given cabinet (Mic A and Mic B). First you choose your cabinet. Then the 2 microphones you will use. The next window is where you set levels, mute and phase for each microphone. Note: all the microphone in all the Two notes Virtual Cabinets are already captured in phase with each others, so the Phase parameter is not needed to correct the relative phase of the two microphones. This parameter can rather be used to get a specific out-of-phase effect, or correct the phase between the C.A.B. M microphones and an external signal. The following window shows you how the mics are placed in regards of the cabinet, and this part will let you do the mic placement for each microphone with the following sequence of parameters. Axis : You will set the placement of the mic towards the cone of the cabinet's speaker. At 0% the mic is placed at the center of the speaker, at 100% the mic is placed either at the edge of the speaker (when the mic is at the grill cloth), or up to 1 meter (3 feet) away from the center (when the mic is at the furthest distance of the cabinet). Dist : You will set the distance of the mic towards the cabinet. At 0% the microphone is placed at the grid cloth of the cabinet. At 100% the mic is placed at 3 meters (10 feet) from the cabinet. Side : You will place the mic at the Front or at the Back of the cabinet. The EQ section has 3 mode of operations : guitar, bass and custom. Custom Mode : Instead of having fixed frequencies to work with, you have a 5 band semi parametric eq with a low cut filter. To enhance you experience with the Torpedo C.A.B. M, especially when playing with headphones, your unit features different reverbs. This mode is solely dedicated to third party IRs. The Torpedo C.A.B. M allows for the use of IRs which are up to 200 ms long. The interface of the IR Loader mode is similar to the Simulation mode. It differs only in the Miking section. For a description of the other sections, see the Simulation mod description above. The MIKING menu is where you will choose the IRs you want to use. Just like in simulation mode where you can dual mike a cabinet, you will be able to select 2 IRs to be used at the same time. You have access to the Folder where you will then select an IR. First you choose your folder where you will be browsing the IRs you need. Then the IR file you will use. The next window will let you set levels, mute and phase for each IR. Now that we have covered the 3 different modes of the C.A.B. M in the MENU environment, we will look at the sections which are common to all 3 modes. This parameter lets you set the level of the preset. It is independent of the output level (set in the PERFORM environment), which is the same for all presets and acts as a general, master level. This section allows you to save a preset. First you rename the preset by scrolling the characters. When the name is done, press Enter (the right encoder knob) to select the memory slot where you will save the preset. Once you have chosen the slot, press enter. The unit will display « Saving, please wait… » and when saved, you will be at the memory location you saved for this preset. Here you will have access to parameters that concerns the aux input, the display, the memory,etc. You set the level of the AUX input located on the left side of the pedal. You can mute the signal by pressing ENTER. The signal coming from the AUX input does not go through the C.A.B. M processing (Power Amp, Miking…). Only its level is adjusted before mixing it at the output of the unit. Keep in mind that the AUX input is downmixed from stereo to mono. This setting combines the resolution of the third party IRs you are using and the latency it generates. If you choose a low latency setting, your IRs will be truncated at 40ms. Selecting a higher resolution for the IRs (up to 200 ms) will result in more latency. The indicated latency is the actual latency of the whole device, measured from the input to the output. Even at the highest setting, the latency is low enough not to be noticed when playing. However, latencies add up when using several digital products, which can lead to a point where it becomes noticeable. In that case, lowering this setting can prove useful. The Torpedo C.A.B. M comes with a memory card of 256 MB to have access to more third party IRs in the IR loader mode. Here you can browse the IRs you have loaded on the memory card (only 48KHz .wav files are displayed). If you need to load other formats of IR files, please read below on how to do so using Torpedo Remote. When your Torpedo C.A.B M is connected to a computer, you can view the content of the memory card by pressing Enter (the right encoder knob) to mount the memory card. Your pedal will then show up as a storage unit in your computer. When the memory card is mounted, the interface of the C.A.B. M is locked, in order not to interfere with the computer. Press ENTER once you finished editing, copying, moving or erasing files to unlock the C.A.B M.
When you activate the Bluetooth control from your mobile device, to sync with the C.A.B. M you will need to input the pin given here. If you want to reset the pin, you press Enter to renew the pin, and you have to power the unit off (unplug the power adaptor) then on (plug the power adaptor back in) to reboot the unit so that the new pin is taken into account. This setting determines the brightness level of the display screen. The OLED technology used in the screen of the Torpedo C.A.B. M allows for better display with higher resolution graphics. This technology is however known to be sensitive to a burn-in phenomenon, when continuously displaying the same graphics. To avoid this issue, we implemented a set of screensaver options. We recommend you use them to increase the lifespan of the display screen. You can choose between an animation, a dim of the display, or the screen going into sleep mode (turns off) after a delay period you set from 1 to 60 seconds. This menu indicates whether you are connected to the Remote or not, and if you are connected to the C.A.B. M by USB or by Bluetooth (BLE). This can be used to troubleshoot communication issues with the Remote and Wireless Remote softwares. Here you can see which firmware is installed in the Torpedo C.A.B. M. You also have access to the serial number of the machine (which is also available on a sticker under the unit). This serial number is used to register the unit, as well as differentiate between several units in the Remote and Wireless Remote softwares. 4.3.7 Which cabinet is the right one for me? The Torpedo C.A.B. M comes with 32 cabinets, for bass and guitar. Among these cabinets you will find some that you know, others that you should know, and maybe the hidden gem that will work for you and you had no idea. To work faster, you should make sure the EQ, reverb and anything apart the cabinet and microphones are turned off so you can concentrate on that part of the process. Please try the cabinets without too much preconceived idea about what you think you need. Often, the solution comes from a cabinet you wouldnt think of. As a general guide, we recommend using small sized cabinets for more mids and high frequency, they are good for solos and clean tones. Use the big boys on distorted and/or or rhythm guitars. 4.3.8 Which microphone is the right one for that cabinet? With the Torpedo C.A.B. M, you will choose a ribbon microphone if you need a smooth, creamy tone. They are perfect when the guitar or the bass is in a light mix (meaning without tons of other instruments or distortion). We always recommend that type of microphone for the guitarist or bassist who is approaching miking techniques for the first time, they will sound very close to what you hear on your traditional guitar or bass cabinet. With the standalone software Torpedo Remote, take control of the unit via USB, change the parameters, arrange or add/delete cabinets and IR files, and apply updates. Torpedo Remote will detect any new update or new Two notes cabinets (it requires a working Internet connection). You can download Torpedo Remote for Windows and MAC OSX from the Two notes Audio Engineering website. Like the pedal, the Remote is arranged around the 3 modes : Arcade, Simulation and IR Loader. Here are the different layouts. Arcade mode with the simplified rack and one microphone to move around the cabinet. The Simulation mode gives you access to all parameters and the two microphones, which can be placed at the front or the back of the cabinet. The IR Loader mode gives you quick access to the 2 IRs you can use simultaneously, with a bigger display to visualize the complete name of the files. The Remote allows you to easily organize your Two notes virtual cabinets, your presets and your third party IRs. Program Files\Two Notes Audio Engineering\Impulses sur Windows (32bits). Program Files (x86)\Two Notes Audio Engineering\Impulses sur Windows (64bits). /Library/Application Support/Two Notes Audio Engineering/Impulses sur MAC OSX. You can preview any cabinets that are not in your licence when using the Remote. This is why when you browse the cabinets in the Remote the list is way bigger than what you have in your licence or in your Torpedo C.A.B. M.
Cabinets which are on your Torpedo unit. Cabinets which you do not own but can preview before buying them on the Two notes Store. 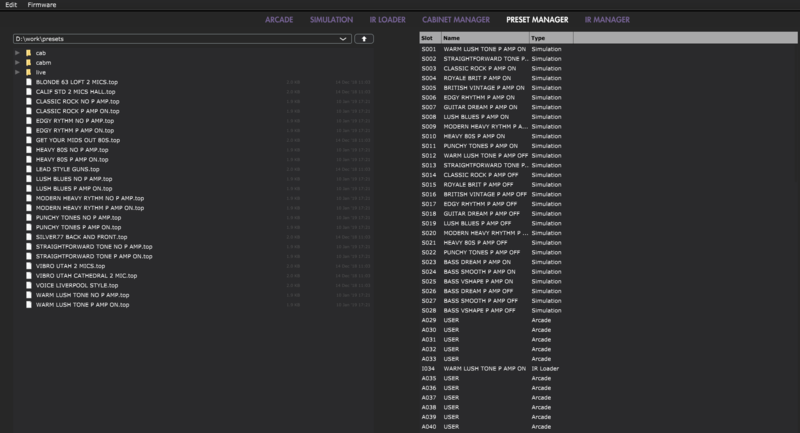 When you are previewing a cabinet that is on your computer (which means that you own it and it is in your license stored in your computer), the Remote needs to load the cabinet first so you can edit all the parameters. As you are previewing, you will only have access to one microphone for the cabinet. Audio is still going through normally through the pedal, so you can use the C.A.B. M like you would normally. This box allows you to transfer the cabinet you are previewing from your computer to your C.A.B. M (as long as you have memory slots available in your unit). When you are previewing a cabinet that you do not own, random silences are inserted and you have access only to one mic to preview the cabinets. No billing or information on the payment method is stored on the Remote, so as to ensure maximum security. Torpedo C.A.B. M complies with third-party Impulse Responses (IRs) in .wav or .aiff format, 16 or 24bits, 44.1Khz to 96Khz. To load a file into the Torpedo C.A.B. M internal memory, use the IR Manager window. The left panel is the files on your computer. You can browse the folders where you have stored your IRs. The right side represents the IR files that are loaded in the Torpedo C.A.B. M. You can drag and drop the IRs from the computer (left) to the Torpedo (right). If you wish to free memory slots in the pedal, you can drag and drop the IRs to the bin at the bottom. IR length: increasing the IR length will improve the resolution of the Torpedo processing (more precision will lead to better accuracy in the low end). Please note that a 40ms IR will take 2 slots in your Torpedo C.A.B. M' s internal memory. * Min Phase: an algorithm will move the samples in the file so it will sound in phase with any other IR file (provided you use that function to transfer the other files as well). * Min. IR Latency: the file is cut so there is no silence before the first sample, this can lead to a change in the sound but your latency will be minimal. * Original: the samples in the file remain untouched. You may experience phase cancellation issues with mixing it with other IR files. Uber75 4×12 cabinet with Celestion® G12T-75 and V30. Mesa/Boogie® 1×12 with Blackshadow® C90 speaker. Each cabinet in the Two notes library comes with a choice of 8 microphones. The selection of microphones depends on the type and model of cabinet. In other words, some microphones in the following list will not necessarily available with the cabinet you selected.